Pirates are, perhaps, one of the most well-known professions that find themselves in possession of a great many coins; one might even consider pirates collectors of coins with a collection that was frequently subject to change. 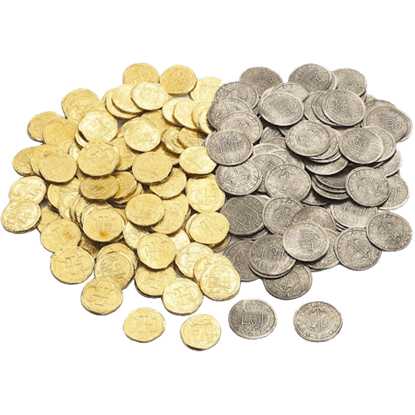 And of course, we are here to offer a number of fantastic pirate coins for the modern-day pirate who finds himself, or herself, decidedly lacking a good amount of pirate coins. 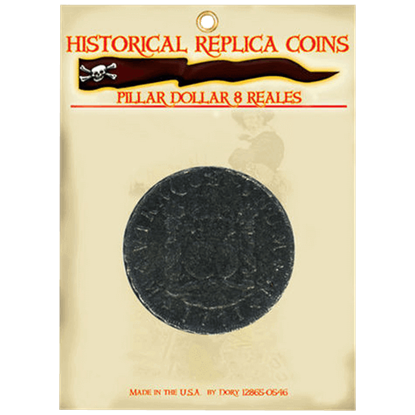 We carry a variety of pirate coins, from the cherished gold doubloon to the well-known piece of eight, which has found a place not only in world history but also within pirate lore. Each pirate coin features fantastic detail, and they are great for collectors and pirate enthusiasts alike. Of course, these pirate coins also make for great show-pieces when taken to pirate festivities as well: what pirate would not want to show off a bag full of pirate coins? 100 Gold Shields Centen was coined during the reign of Felipe IV in 1637. The 100 Gold Shields is a great item to add to your replica coin collection or to take to reenactments. This coin features amazing details and is made by Denix. So, you have decided to commit to a life at sea, sailing the Caribbean and pillaging and plundering merchant ships. 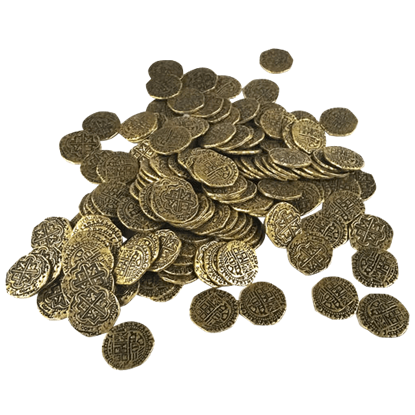 You are going to need some treasure to start with, so grab yourself a bag of 150 Small Golden Pirate Coins and set sail! The treasure of a pirate is often more than just gold coins, there are silver coins in there too! The 150 Small Silver Pirate Coins will add a flair of silver booty to your treasure chest, so set sail and get to plundering and pillaging! Next to rum and the open sea, a pirates favorite thing in the world is treasure! 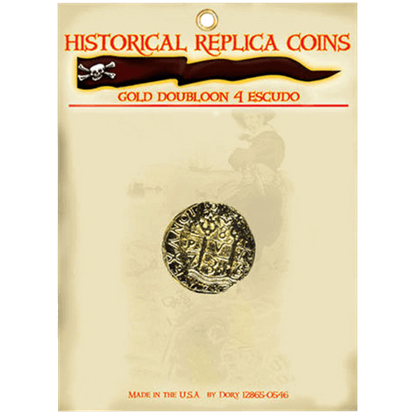 You can begin to amass your treasure with the 4 Escudo Gold Doubloon Replica Coin! Its shiny, golden colored surface is perfect for a pirates hoard! A pirate is measured by three things- how cruel they are, how many ships they take, and how much treasure they amass. 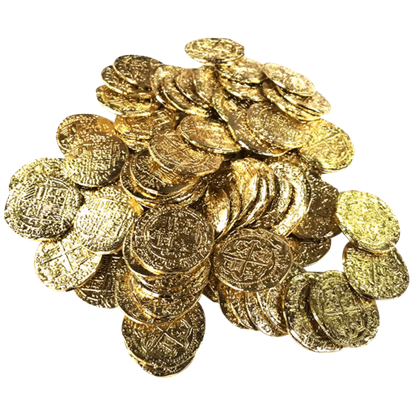 You can start on your road to a large fortune with these 50 Large Golden Pirate Coins! All you need now is a chest! When it comes to money pirates are not picky people. 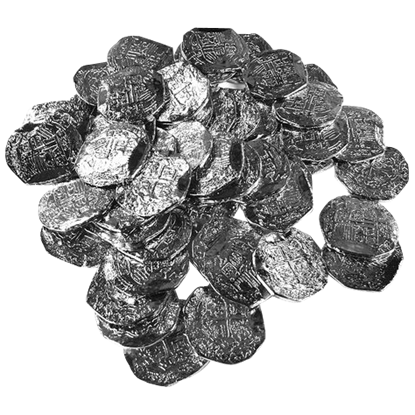 Sure, they prefer gold, but they would never turn down these 50 Large Silver Pirate Coins! Silver is just as useful at buying things as gold, and these bust pesos can be broken up! This Set of Pirate Coins is a mix of 2 lots of 25 reproduction coins. This set includes 25 gold doubloons and 25 silver Reales. 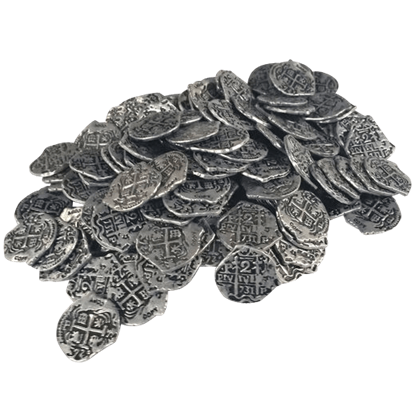 All our coins are made from pewter that is either antiqued or gold plated. Pirates love their gold doubloons more than any of their other treasures! 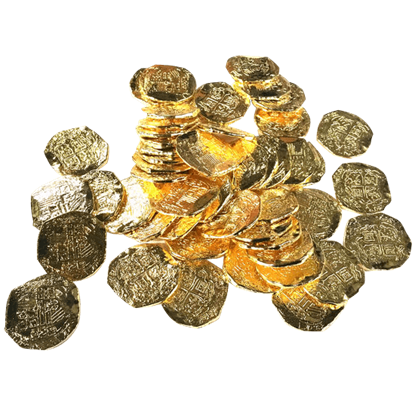 Gold is incredibly valuable to them, so these 75 Medium Golden Pirate Coins are something you will need while you are journeying across the Caribbean seas! Silver is a popular metal to trade with, making it a popular treasure for pirates! 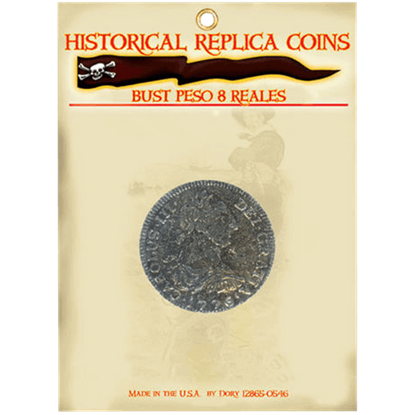 With silver bust pesos, like what is seen in the 75 Medium Silver Pirate Coins, you could buy anything you could possibly need to sail the open seas! The Spanish bust peso was capable of being broken into 8 pieces, earning it the nickname Piece of 8. Like the name of the 8 Reales Bust Peso Replica Coin suggests, this silver coin was worth 8 Spanish Reales when whole! 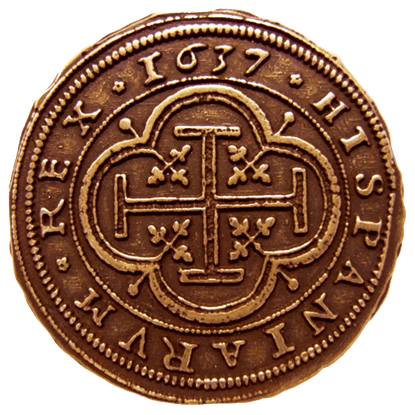 Before the Escudo and the Peseta, the Spanish currency was the Real. The pillar dollar, which came after the Real, was worth 8 Reales at its largest size, like the 8 Real Pillar Dollar Replica Coin, and 1 Real at its smallest. Typically, after it was traded for something, the owner of a Spanish silver cob would melt it down for the silver. 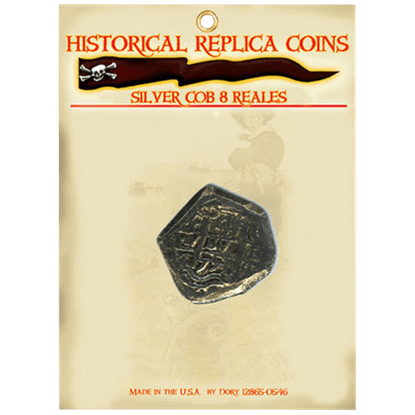 This is why the 8 Reales Silver Cob Replica has such an unusual shape, as they were made to be temporary coins.